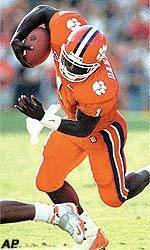 CLEMSON, S.C. – Put a label on Clemson’s Woodrow Dantzler at your own risk. And don’t be surprised if he proves you wrong. Is Dantzler a quarterback with a runner’s feel, or a tailback with a powerful arm? Is he the latest in the line of dual-action NFL stars like Donovan McNab and Michael Vick, or a redo of the single-wing runner whose 5-foot-11 height won’t ever get him to the NFL? Is he the serious leader on the sidelines who’s a bit of a loner, or the character who carries stuffed animals to games and watches the Japanese cartoon, “Dragon Ball Z”? That’s how Dantzler likes it. Woody the Wizard’s best revelations come on the field, as in Saturday in Clemson’s 47-44 overtime win at then-No. 9 Georgia Tech. Dantzler ran for two touchdowns, threw for two, and had 418 yards of offense. Dantzler is cool and sometimes short when talking about himself or his Heisman Trophy chances. However, he gives his time and emotion freely to others. He spent the summer as a volunteer counselor at a YMCA camp in the shadow of Clemson’s Death Valley. Brown says Dantzler once carried a Teddy bear in his car one season at Orangeburg-Wilkinson. His teammates and coaches praise his unselfishness and leadership. And then there’s those cartoons, which Clemson offensive coordinator Brad Scott Dantzler watches all the time. “He’s like a kid sometimes,” said Scott, laughing. Despite his success, Dantzler still deals with those who criticize his talents. When he shared time with Brandon Streeter during coach Tommy Bowden’s first season in 1999, some said Dantzler was better suited for running back or wide receiver. Even when Dantzler became the talk of college football in leading Clemson to 8-0 start last season and finishing fewer than 200 passing yards shy of the sport’s first to rush for 1,000 yards and throw for 2,000, there were calls for strong-armed backup Willie “Shotgun” Simmons to play. This year, the boos were loudest when the Tigers fell to Virginia, 26-24, at home Sept. 22. Dantzler committed three turnovers and – despite accounting for 318 yards – blamed himself entirely for the defeat. He heard fan comments again Saturday at Georgia Tech and used it for Clemson’s comeback. So even during a week when Dantzler should rightly hear their cheers, he stays within himself. Dantzler said his attitude was shaped by his mother, Mozelle, leading the family after his father was eventually disabled from exposure to toxic chemicals during the Vietnam War. Bowden challenged Dantzler’s character Saturday, saying after a first-quarter fumble that he would sit if the turnovers continued. “He would have done it,” Dantzler said. “He responded like he knew he would,” said the coach. When offense and defense were worried at halftime with Clemson down 19-14, Dantzler calmed the team and got them going to their first road win against a top-10 opponent since the 1981 national championship year. Dantzler said the worst part of his success is talking to the media – not the public. He has no problems talking to someone on the street, however. “I love meeting people. If I got time, I’ll talk to them all day. Kids, I’ll play with them forever,” he said. Inside the team, Dantzler’s a trusted, fun leader, guard Will Merritt said.